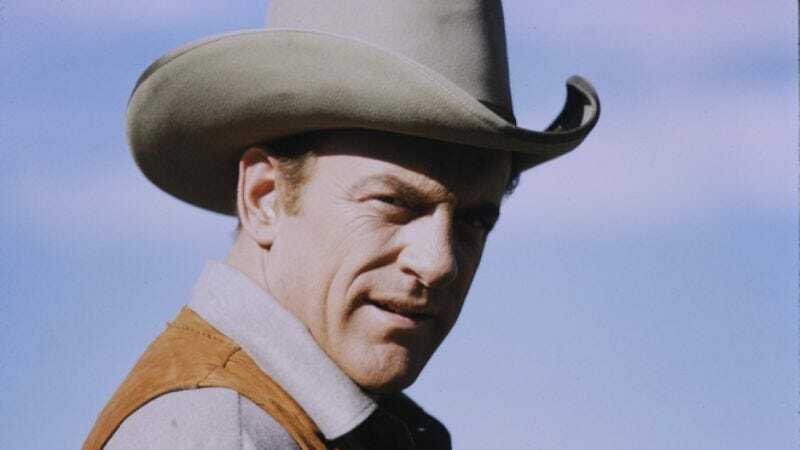 James Arness, who spent 20 years dispensing stoic justice as the star of Gunsmoke, has died, according to a CBS spokesman. There were no further details other than he died of natural causes. He was 88. As Marshal Matt Dillon, Arness was a gentle giant, a 6-foot-7 laconic force for good tasked with keeping the peace in Dodge City, but doing so in a manner that resisted the usual shoot-first, ask-questions-later strategy of most Western heroes. In fact, Dillon’s reluctance to fight or whip out his six-shooter was one of his most defining characteristics—and also the reason he was shot around 30 times over the course of the show—and Arness imbued Dillon with his own natural sense of morality and decency. Arness inherited the role from William Conrad, who played the character for nine years in the radio version, but was never a serious contender for the television adaptation due to his own portly figure. Legend has it that CBS offered the part first to John Wayne—something that original director Charles Warren has disputed, but it is known that Wayne ended up recommending his good friend Arness. Arness was the center of Gunsmoke for its entire history-making run from 1955 to 1975, TV’s longest-running dramatic series until it was recently tied by Law And Order. For his work, Arness scored three Emmy nominations. Before Gunsmoke, Arness served in World War II where his leg was shattered by a machine gun; he spent nearly a year in the hospital and left with a lifelong limp, as well as a constant pain that made it extremely difficult for him to ride a horse. After his discharge, Arness started (like his younger brother, Peter Graves) as a radio announcer before landing in Hollywood. He found steady work in films—many of them Westerns, including quite a few opposite his pal John Wayne, like Big Jim McLain and Hondo. He also starred in two classic science-fiction movies: Howard Hawks' The Thing From Another World (later remade as John Carpenter's The Thing), in which Arness is unrecognizable as the titular, monstrously tall humanoid plant creature; and Them!, in which he plays an FBI agent tasked with fighting giant irradiated ants. Once Gunsmoke was over and Arness was irreversibly identified with the Old West, he starred in several more Western projects, including the miniseries How The West Was Won, a role that made him something of a cult figure in Europe due to its numerous reruns there. But he also made a bid to contemporize in the short-lived McClain’s Law: As a cop dragged out of retirement to school a younger generation of police officers, Arness played a bit more of a loose cannon than he had as Marshal Dillon, and the show was far more violent than Gunsmoke had ever been. It only lasted a season. Following its 1982 cancellation, Arness took some time off from television, then returned to more familiar territory in the 1987 TV movie The Alamo: Thirteen Days To Glory, where he played frontier folk hero Jim Bowie. He primarily spent the rest of his acting career revisiting his most famous role in a series of Gunsmoke specials, five in all, the last of which aired in 1994. Although he was a notoriously private man, Arness published his autobiography in 2001, in which he attributed his fame to sheer luck and good fortune with his typical humility and even-handedness—a true cowboy to the end.